At U.S. Music Lessons we believe in making music lessons not only educational, but fun! We understand that our students all have different goals and purposes for learning music and we play to the drives and strengths of the student. We know after years of experience that if you try to “make” someone learn to play an instrument it will only turn them off . We are here to engage and inspire our students and build their love of music, so that they stay with it longer and have a better success rate. We offer in-studio and in-home lessons in Guitar, Voice, Violin, Piano, Drums, Bass, and Ukulele. We also offer a Rock Band program and preschool learning class for ages 3 to 5. With such a variety of instruments and programs available, there is something for the whole family. You'll save time and money since one family can take multiple instruments on the same day! We have 25 teachers here at US Music lessons all of whom have degrees in music as well as years of performance experience. You or your child will benefit greatly from their real life experience as musicians. With at least three music teachers for every instrument, we are confident that we have the right teacher to meet your music lesson needs. 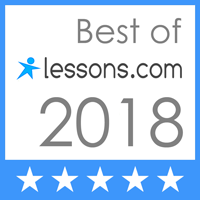 In addition to their teaching credentials, our teachers have warm personalities, are extremely friendly and dedicated to teaching you the style of music that you want to learn in your music lessons. For those students who have specific academic music goals, we offer Certificate of merit testing. The Certificate of merit curriculum prepares our students to pass the standardized California test for musical achievement . 4. Trophies, certificates and award wristbands to celebrate achievement. We are the only music school in San Diego that gives their students the opportunity to earn special color wristband bracelets (kids and teens love them! ), trophies AND certificates for passing musical tests. Do other schools offer trophies and certificates? A few. But none of them inspire their students by giving them full color, really cool “Musical Ladder” wristbands that they can show off to their friends. More importantly when our students have a test coming up, they practice more, their parents are proud, their teachers are proud, and everybody wins. We are open Monday through Friday, 10:00 AM to 8:00 PM, Saturday and Sunday, 9:00 AM to 4:00 PM. We also have morning and lunch hour lessons for adults, and homeschooled and Charter Schooled student. Visit our Testimonial page to see what our students are saying. Our full time mission is teaching quality and enjoyable music lessons for kids and adults. Since 2009, we have taught thousands of people and are currently trusted by over 400 families. Our rooms are fully stocked with everything you need for for music lessons, including amps full drum kits, keyboards pianos and more. We have invested thousands of dollars on our studios to make your lesson experience great! We also have LED Monitors for your favorite mobile device in each room allowing students to have a modern and engaging lesson using the many great music teaching apps and software. Conveniently located at 17150 Via Del Campo Suite 306 in 4S Ranch and serving all areas of San Diego with lessons in our studio as well as in your home! We want students who truly want to be here so U.S. Music Lessons does not require semester minimums or long term contracts for lessons. If you are ready to start, you have nothing to lose! Lessons are first come, first serve so contact us today to arrange your first lesson.